Tiki Dooms are enemies first appearing in the game Donkey Kong Country Returns. They first appear in the Jungle area. Tiki Dooms look like a larger variant of Tiki Goons. They are wooden, bongo-shaped enemies. They have a large head with a cloth on top, a square nose, yellow pupils, and black retina. They have four horns, two on each side of their head, with three red feathers attached to the two bottom horns. 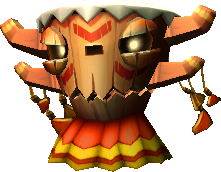 Tiki Dooms have a red marking above their eyes and have a orange, yellow, red, and brown striped skirt. To defeat them, Donkey Kong or Diddy Kong must jump on them three times, roll into them, throw a barrel at them, or run into them with Rambi. As the player jumps on a Tiki Doom, it becomes noticeably weaker, as its eyes become very drowsy looking. This page was last edited on September 9, 2018, at 14:45.